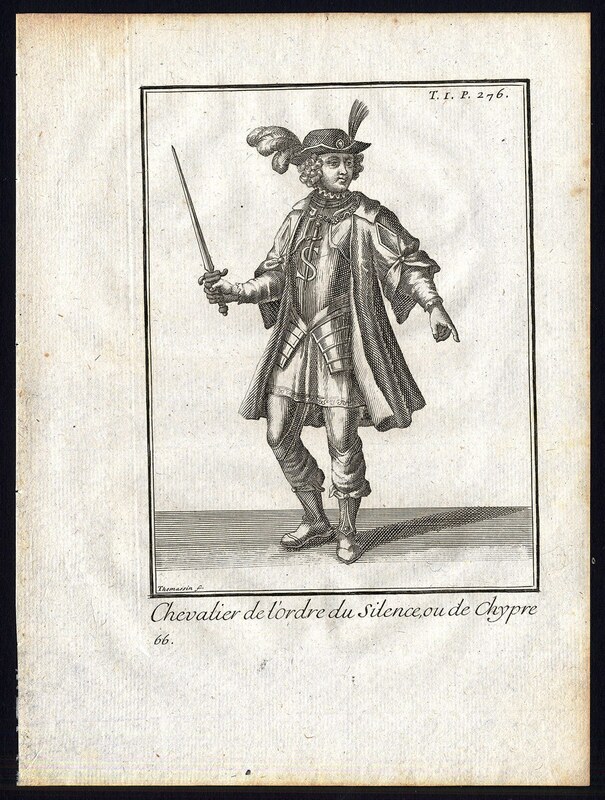 A Knight of the Sovereign Order of Cyprus – also known as Knight of Sword and Silence – is represented on a French print, published in 1792 in Paris. This print originates from a book: “Histoire des Ordres Religieux et Militaires et des Congregations séculieres de l'un et de l'aure sexe, qui ont été établis jusqu'á présent” - (History of Religious and Military Orders). The book was written in French by a Franciscan priest and historian R. Pierre Helyot, first published 1714-1719 in 5 volumes, in Paris. History of the author: Pierre Heliot (1660-1716) was born in a noble family. At age of 24 P. Helyot entered the convent of the third order of St. Francis, founded at Picpus, near Paris, by his uncle Jérome Helyot, canon of the Order of Holy Sepulcher, and he received the name of Père Hippolyte / Father Hippolyte Hélyot. He became a Franciscan friar and priest of the Franciscan Third Order Regular and a major scholar of Church History, focusing on the history of the religious Orders. He received the name of Père Hippolyte / Friar Hippolyte Hélyot. He made lengthy journeys throughout Europe, which afforded him ample opportunity to collect material for his great work on the religious orders. It treats the history of religious and knightly orders, and of congregations of both sexes, down to his own time, and exhibits more particularly their origin, growth, deterioration, suppression, or dissolution, various offshoots and reforms; adding also the lives of the chief founders, and illustrations of different monastic habits. Being written on scientific principles, though not always with critical insight, it was very favourably received, and achieved a wide circulation (Catholic Encyclopedia). Volumes 1-5 by Helyot and volumes 6-8 generally attributed to Maximilien Bullot. The book is illustrated by large plates representing the religious habits of the various Orders, and in the edition of 1792 the plates are coloured. It was translated into different languages: Italian (1737) and German (1753). The whole material was arranged in a form of alphabetical dictionary, by M. L. Badiche, for inclusion in Migne's Encyclopédie théologique, under the title “Dictionnaire des ordres religieux” (5 vols., I 858). Artists and Engravers: The author of this work is Pierre Helyot / Father Hyppolyte Helyot (1660-1716). Engravers include P. Giffart, Thomassin and T. Duflos. Thank you very much for this very valuable document concerning our great Order and its members, the Knights of the Sovereign Order of Cyprus. We highly appreciate your kind attention and contribution to the enrichment of the history of the Order of Sword and Silence.